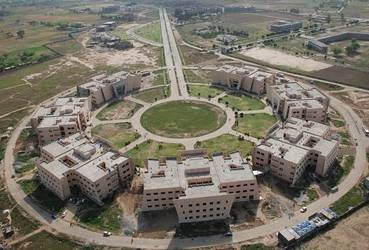 University of Gujrat (UoG) is a world class university and one of the biggest public sector universities of Punjab. UoG is not only serving the education needs of District Gujrat but also the students of Sialkot, Gujranwala, Mandi Baha ud Din and other cities of Punjab are studying here at University of Gujrat. Main Campus of UoG is located in village Hafiz Hayat, about 12km from Gujrat city in a population free environment. Main campus is designed by well renowned architects over an area of 122 acres. University of Gujrat was established on the land of Muslim Saint of Mughal Era, Hafiz Muhammad Hayat. He donated this land to emperor of that time for educational purpose. In 2004, Government of Punjab, led by then-Chief Minister Chaudhry Pervez Elahi, established University of Gujrat. UoG was formally inaugurated on July 3, 2007 by Chaudhry Shujaat Hussain. Dr. Mohammad Nizamuddin is a foreign qualified Professor. He studied at University of Michigan and University of Chicago. He served UN for 24 years. He has taught in various international universities; Columbia University New York, University of North Carolina, University of Jordan etc and in University of Punjab. He has also written many research papers and conducted international seminars and conferences. Prof Dr Mohammad Nizamuddin became 2nd Vice Chancellor of UoG in September 2006. He make this institute more developed and popular nationwide and internationally with his matchless efforts. University of Gujrat offers different undergraduate, graduate and postgraduate degree programs in its various departments and colleges. UOG offers degrees in Computer Science, IT, Engineering, Islamic Studies, Languages, Law, Business Administration, Commerce, Management Sciences, Social Sciences, Chemical and Biological Sciences, Hotel Management, Physics, Maths, Arts, Pakistan Studies, International Relations etc. IT Friendly environment with state of the art computer labs, computer networking and multimedia equipped classrooms. Transport facility with a fleet of buses and vans which provides pick and drop facilities to students (girls and boys) and university faculty and staff.